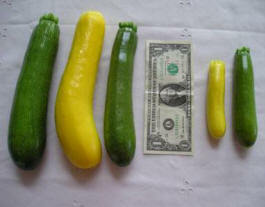 Typical size of zucchini harvested every 2-3 days on left, daily on right. Stems were cut to about 1/2 inch on large squash, a little less on small squash, before weighing. Photo taken 8/23. Weight of harvested squash decreased over time. Interestingly, the size at which I harvested the squash decreased late in the season as temperatures dropped and day length shortened. Table 1 shows the average weight of squash harvested prior to September 16 and after that date for the 4 varieties and two harvest frequencies. When harvesting daily I picked patty pan varieties at a size that was 40% smaller during the second half of the season as compared with the first half. Green squash picked every 2-3 days decreased much less in size over the season, only 15%. Yield of squash harvested each week generally tracked fluctuations in temperature over the season, as one might expect. Harvesting larger squash yielded ~3 times more squash by weight during peak production. Weekly squash yield in grams for squash harvested daily or every 2-3 days. Blue line (DD) indicates degree day accumulations for the week. Although harvesting every 2-3 days at a larger size yielded more kilograms of squash than harvesting daily at a small size (see bottom of the table), the daily harvests yielded a greater number of fruits. In the case of yellow patty pans, more than 3 times more small fruit were produced by the end of the season than large fruits (Table 2), compensating for the greater yield in weight of harvesting less frequently. However, the other varieties only produced 1.5 to 2 times more fruit when picked small. Harvesting mini squash yielded 2 -3 times more squash numbers than harvesting large squash. Bottom: Total Kg of squash fruits produced during the season, and ratio of 2-3 day harvests to daily harvests (%). Time to harvest the squash ranged from 15 to 45 minutes per day during peak production. This is a longer time than it would have been if I was not trying to keep production from each hill separate. Time to harvest per se was not a limiting factor in the harvest. Daily harvests do require dedication, however. In 2007 I kept track of time spent working my squash patch. I estimated that my husband and I spent about 13 man-hours on the squash patch before harvest, including tilling, moving compost onto the plot (with the help of our neighbor's tractor, a huge time saver), spreading the compost, planting seeds, and weeding. Once squash started to produce fruit I spent an average of 5.8 hours harvesting per week (range 3 hrs in October when squash grew very slowly because of cold to 8 hours harvesting per week at peak production). Copyright © December 21, 2007, Karen Strickler. All rights reserved.